Singles Knockout runner up - Martin Lamb. Doubles Knockout winners - Ben Laws & Mike Beedle. Doubles Knockout runners up - Dave Hambley & Neil Inglis. Heaviest Fish in a competition - Colin Stainthorpe - 12 lb 11 oz (18th March 2012. Heaviest Fish out of competition - Paul Short - 9 lb 04 oz (11th December 2011). Christmas match winner - Matthew Garbutt - 14 lb 08 oz - 4 fish. Christmas match Heaviest Fish - Martin Lamb - 6 lb 04 oz. Greatest number of fish - Matthew Garbutt - 201 fish. Heaviest Bag of Fish - Martin Lamb - 17 lb 09 oz - 4 fish - (8th January 2012). 1st - Jay Allison - 11 lb 06 oz - 12 fish. Junior Heaviest Bag - Jay Allison - 9 lb 12 oz - 9 fish (30th November 2011). Total weight for the season - 1,934 lb 12 oz. Total Number of fish - 1,600. Match 1 of 50. Wednesday 28th September 2011. High water 1723 hrs 5.9 metres. Autumn, feels more like summer with a warm south westerly wind, bright sunshine, cloudless sky and sea like a mill pond. 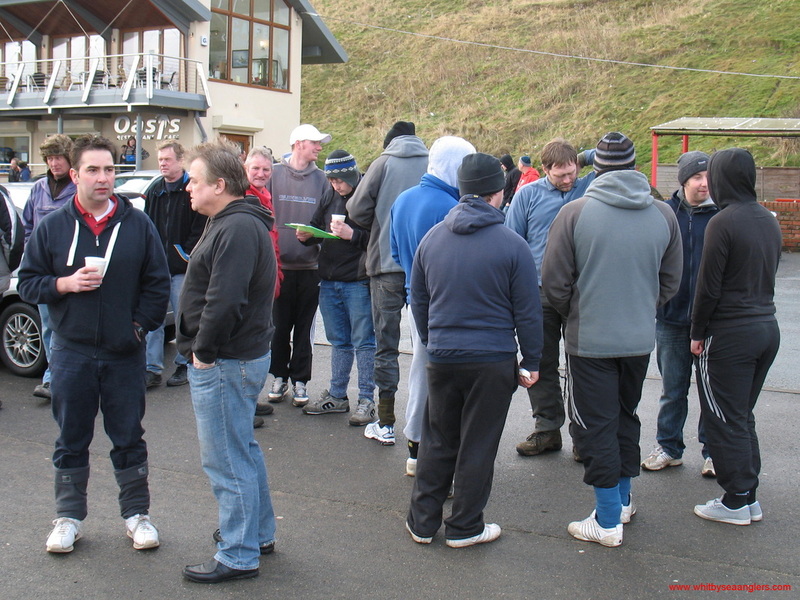 A good turnout, at the Bandstand, as anglers met for WSAA 1st match of the 2011 - 2012 Season. WSAA welcomes the five new members and anyone else wanting to join is welcome at the 'Weigh in' outside Whitby Angling Supplies, 65 Haggersgate, every wednesday and sunday night at 2200 - 2230 hrs. 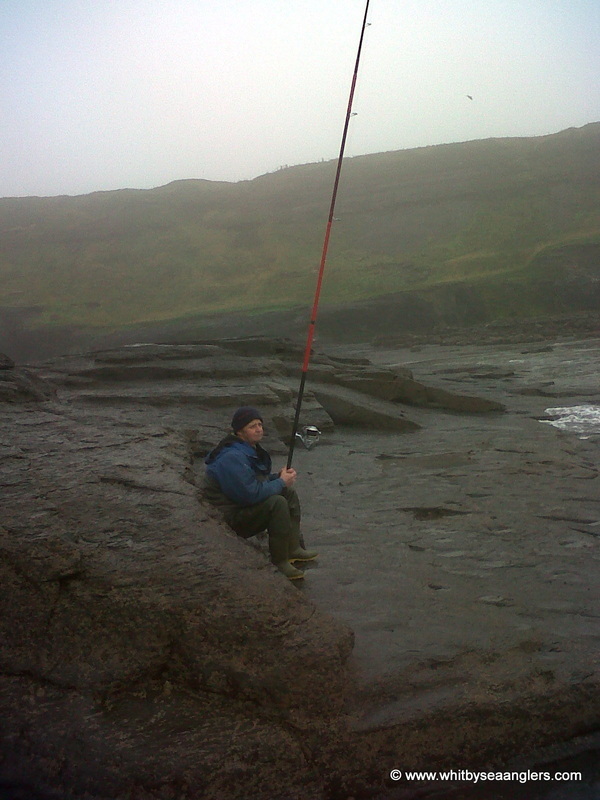 Fishing an ebbing tide, starting nearly 2 hrs after a 6.1 metres high water, conditions were far from ideal. 7th Colin Stainthorpe with 1 fish for 05 oz. Match 2 of 50. Sunday 2nd October 2011. High water 2018 hrs 5.2 metres. A warm south westerly breeze, rain and a very calm sea conditions did not deter anglers. Sunday's 4 hr match started at 1800 hrs, with high water at 1931 hrs. 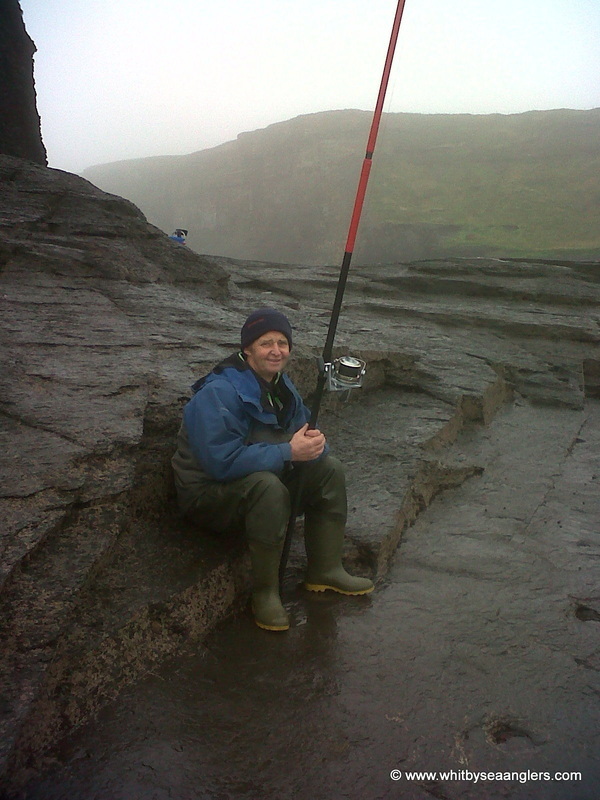 Conditions forcing anglers far and wide, to find deep water cliff marks. Thirteen anglers were at the scales to weigh in 44 fish for a total of 74 lb 10 oz, wrasse, coalfish, lesser spotted dog fish and codling. Ben Laws being the man of the match with a heaviest fish of 4 lb 12 oz and a total bag of 12 lb 04 oz. Any members, not yet registered, wishing to compete in the doubles and singles competitions should contact club secretary, using the Contact Us form, as soon as possible. New members always welcome. 13th Colin Stainthorpe 1 fish for 1 lb 00 oz. Match 3 of 50. Wednesday 5th October 2011. Low water 1733 hrs 2.4 metres. For the first 3 matches of the new season the conditions have not really altered and far from ideal. South westerly winds and a calm sea. Last night saw the wind increasing and moving slightly more from the west with heavy rain showers. Fishing a slack flooding tide, once again saw anglers travelling to deep water marks. Eighteen members have entered the Doubles and Singles Knockouts - Draw will be done shortly, with one preliminary round. All being well Singles Knockouts to commence wednesday 19th Oct and Doubles to commence wednesday 26th Oct.
Low water at 2135 hrs 1.7 metres. Sunday nights fishing started 2½ hrs after high water. What north easterly swell there was earlier in the day was dropping off as fast as the ebbing tide. A strong and strengthening westerly wind did not deter anglers with 12 coming to the scales. Twenty one fish weighed in for a total of 24 lb 14 oz. Dave Hambley weighed in the heaviest fish so far this month with a codling of 5 lb 13 oz. 4th Rob Allison 2 fish for 2 lb 13 oz (WSAA record - pouting of 2 lb 07 oz & a rockling). The knockouts were drawn last night and the preliminary rounds are as follows. On the leader board after 4 matches as of Sunday 9th Oct. 2011. 19th J Verrill with 2 fish for 1 lb 1/16oz. Match 5 of 50. Wednesday 12th Oct. 2011. High water at 1703 hrs and Low water 2313 hrs 1.2 metres. With an easterly wind and with an increasing north easterly swell, on an ebbing tide, saw 12 anglers at the scales for a total of 35 fish for 50 lb 12 oz. High water was at 1703 hrs and fishing was between 1900 - 2200 hrs. 12th Paul Garbutt with 1 fish for 09 oz. Singles knockouts preliminary round, a week tonight, wed 19th Oct.
High water 1904 hrs 5.1 metres. Seems a little like Groundhog Day, south westerly wind and flat calm seas. With anglers once again forced to travel to deep water cliff marks in order to be competitive. High water 5.1 metres, was at 1904 hrs. Twelve anglers were at the scales with 26 fish weighed. Wrasse, rocklings, coalfish, codling and pollack made up the catch of 34 lb 10 oz. Preliminary round of the knockouts on wednesday night. Match 7 of 50. Wednesday 19th October 2011. At last a good sea, the first of the season but being the first, brought problems of sea weed. 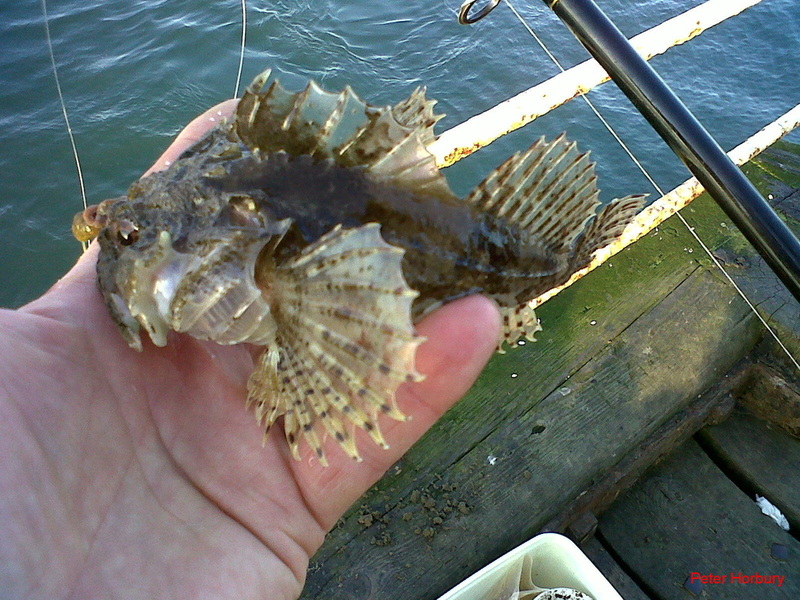 Anglers reporting weed everywhere, kelp, bladder rack and fine grass sea weed hampering their efforts. However Neil Inglis was man of the match with a respectable bag of 4 fish for 11 lb 03 oz. With a strong north westerly wind and long distance, regular northerly swells, anglers fished the last 2 hrs of a flood tide and an hour of ebb. Twenty six fish weighed in for a total weight of 50 lb 01 oz. Martin Lamb beat Dave Hambley and Paul Short beat Paul Garbutt. Next round of singles wed 9th Nov. and preliminary round of doubles knockouts next wed 26th Oct.
On the leader board after 7 matches. Match 8 of 50. Sunday 23rd Oct. 2011. Low water 1959 hrs 1.8 metres. Sunday nights 4 hr match was a very blustery evening with a strengthening south easterly wind with little to no swell and crystal clear water. The match started 2 hrs before a low water of 1.8 metres. Fourteen anglers came to the scales with 34 fish for a combined weight of 35 lb 04 oz. 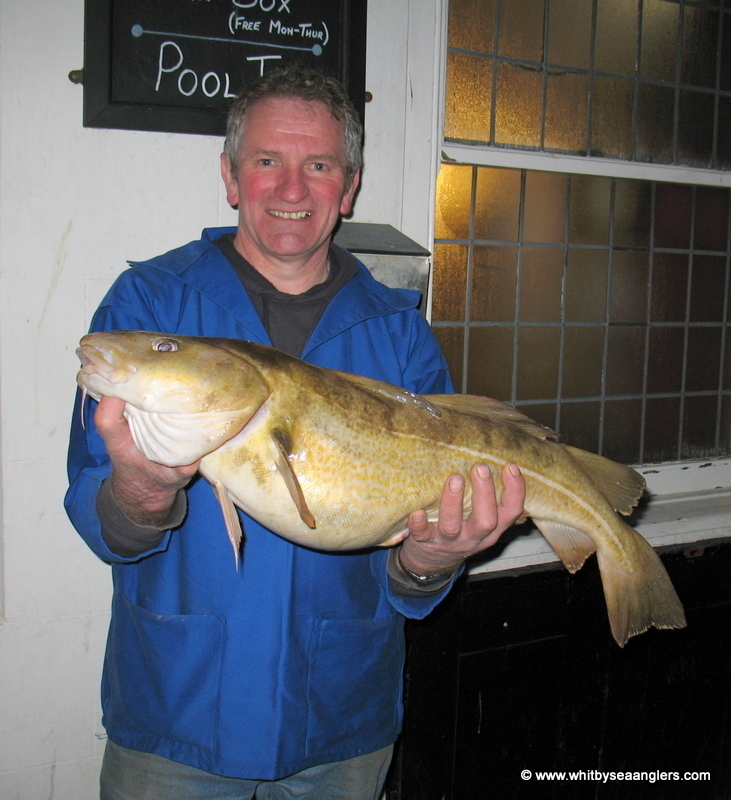 Mick Beedle caught a 5 lb 15 oz codling which at present is the heaviest fish for the monthly sweep for October. A number of members of WSAA took part in the Seaham Open during the day, unfortunately, with no success. WSAA Open match tickets (Sun 13th Nov.) are now on sale at Whitby Angling Supplies, Keith's Sports, Saltburn and Bill Costin’s, Scarborough. £10 Adult, £3 junior. On the leader board after 8 matches. Match 9 of 50. Wednesday 26th October 2011. Low water 2231 hrs 0.7 metres. Wednesday nights 3 hr match was looking promising with a good easterly swell and south by south west winds. Low water was at 2226 hrs with a height of 1.0 metres so popular spots drained off quickly but suffered from surges as the tide was about to turn. Fifteen anglers were at the scales with 35 fish for a total weight of 64 lb 06 oz. The heaviest bag of the night went to Matthew Garbutt with 11 lb 03 oz while Martin Lamb caught the heaviest fish, 5 lb 09 oz. The preliminary round of the doubles knockouts saw D Perrett and M Bowman with 2 lb 09 oz, beaten by W Atkinson and J Verrill with 7 lb 12 oz. 15th N Inglis with 1 fish for 13/16oz. The eagle eyed amongst you, who received your Sea Angler magazine this morning, (Mon 24th Oct.) will have noticed on pages 46 & 47 Whitby SAA A and Whitby SAA B Teams have a mention. October’s results will be sent in after the sunday 30th match. Match 10 of 50. Sunday 30th October 2011. Sunday nights 4 hr match started 8 mins before high water (5.6 metres) with a slight south westerly wind, flat calm sea and crystal clear water. Far from ideal conditions with a few anglers travelling to deep water cliff marks. However 15 anglers were at the scales with 70 fish weighed in for a total weight of 81 lbs 13 oz. There were a few codling, pouting, lesser spotted dog fish, the majority of the fish were coal fish, but two 4 lb pollack were weighed in by J Gilpin. New WSAA record - Heaviest coal fish J Allison (Jnr) 2 lb 01 oz. M Beedle wins heaviest fish of the month 5 lb 15 oz. Match 11 of 50. Wednesday 2nd November 2011. High water 2049 hrs 4.9 metres. 25 lb 12 oz. Paul Short was man of the match with 9 fish for 7 lb 15 oz. WSAA 31st Annual Open Match is on sunday 13th Nov.
11th M Bowman with 1 fish for 8/16oz. Match 12 of 50. Sunday 6th November 2011. Low water 1917 hrs 2.2 metres. Sunday nights 4 hr match started 1½ hrs before low water on a slack tide 2.2 metres. With a fast dropping north easterly swell, colour in the water and a north westerly wind, anglers were hopeful of a fish or two. Denis Thompson was man of the match with a bag for 12 lb 01 oz inclusive of an impressive 5 lb 05 oz cod but Rob Allison piped him, by 1½ oz, with the heaviest fish, (so far this month), of 5 lb 06½ oz. 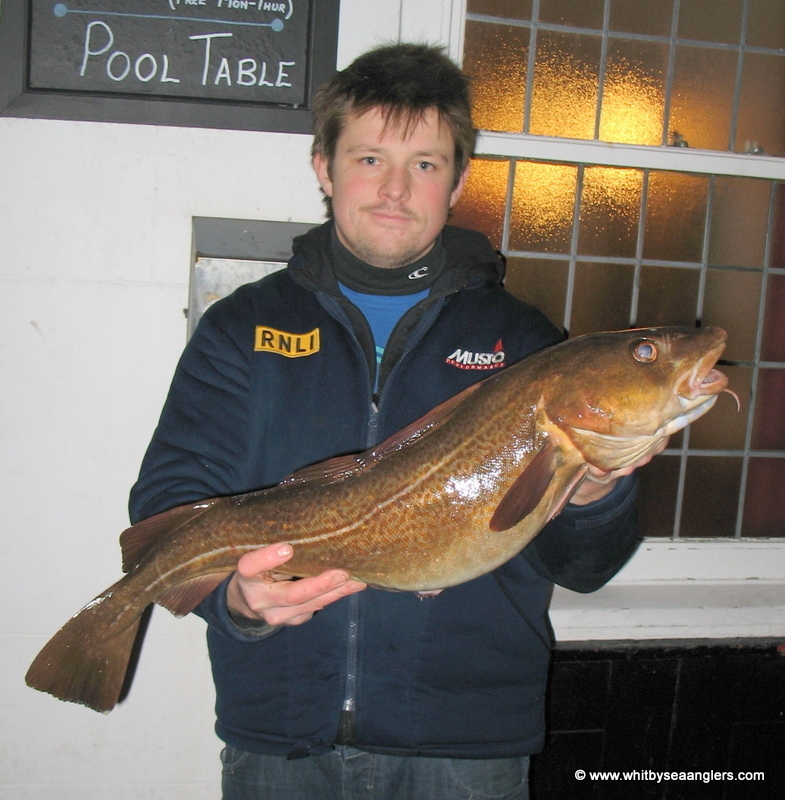 Ben Laws also found a cod of 4 lb 00½ oz. Total weight for the 13 anglers at the scales was 42 lb 15 oz. WSAA anglers are reminded that Wednesday night is round one of the singles knockouts. Sunday 13th November is the 31st WSAA Annual Open and all Whitby Gazette readers are reminded this is an Open match and all are welcome to participate. Fishing from 1000 am - 1600 hrs, low water 1109 hrs 1.3 metres. Tickets are £10 for adults and £3 for juniors, with a 1st prize of £400. Tickets available at Whitby Angling Supplies, Bill Costins, Scarborough and Keith's Sports, Saltburn. 13th D Perrett with 1 fish for 5/16oz. Match 13 of 50. Wednesday 9th November 2011. Low water 2113 hrs 1.5 metres. Wednesday nights 3 hrs match fished the last 2 1/4 hrs of ebb, with a bright full moon and clear skies, conditions were not ideal. A steady east by north east swell and a strong south easterly wind did not deter the 20 club members who fished. Thirteen were at the scales to weigh in 30 fish for a combined weight of 45 lb 03 oz. Andrew Cass was man of the match with a bag of 3 fish for 9 lb 05 oz, the heaviest fish being 6 lb 15 oz which takes the lead for the monthly sweep. 13th P Horbury with 1 fish for 5/16oz. N Inglis beat D Perrett. Next round is wed. 30th Nov. 2011. Next wed. 16th Nov. is the 1st round of the doubles knockouts. Mick Chadwick winner of WSAA 31st Annual Open Match. Sunday 13th November 2011. Photograph by Richard Saltmarsh. Sundays 6 hour open competition started at 1000 hrs, with an hour and a half of ebb left before low water of 1.5m. Conditions were as good as one would expect for this time of year, with low cloud, light drizzle, a south easterly wind and some north easterly swell. 101 competitors were entered and competing for the £400 1st prize, £200 for 2nd and £100 for 3rd. Special prizes of £50 for 10th and 20th places. The scales were open at 1630 -1715 hrs. 24 anglers weighed in, at the Fleece on Church Street, 46 fish for a total weight of 90 lbs 07 oz. 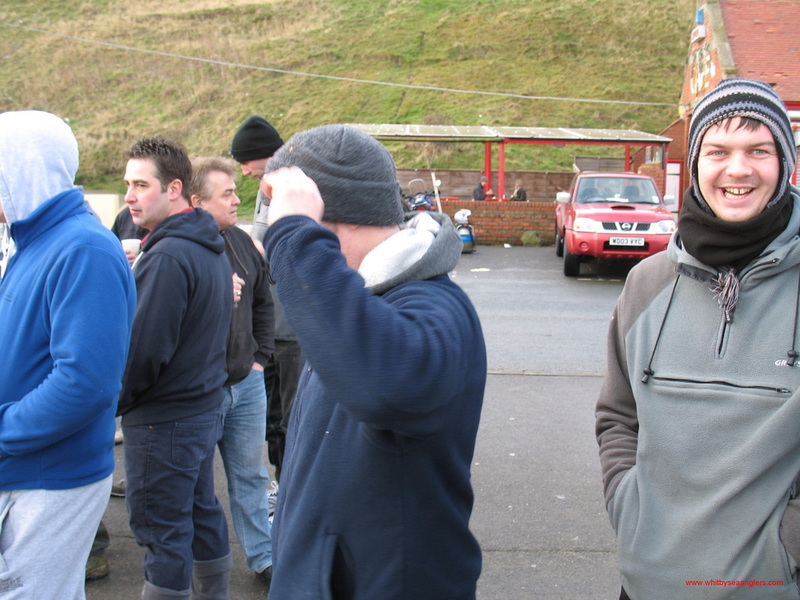 Hot food was provided for the anglers before the presentation of prizes. Martin Greaves of Whitby Angling Supplies was on hand to hand over the winners prizes. After which there was a raffle which was well supported. Sweep of £67 for the 2nd heaviest fish went to Dave Smith 3 lb 15½ oz. A Cass won the special prize for heaviest flattie. Whitby Sea Anglers Association would like to thank all their sponsors for their support. Darren Hanson Heaviest Fish 6 lb 11 1/2 oz. Photograph by Richard Saltmarsh. 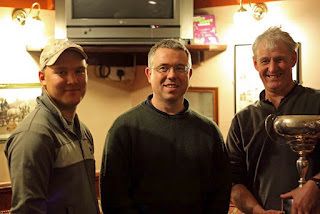 Darren Hanson, Martin Greaves of Whitby Angling Supplies and Mick Chadwick. Photograph by Richard Saltmarsh. Mike Breckon enjoying a relaxed open days fishing. Photograph by Peter Horbury. Match 14 of 50. Sunday 13th November 2011. Low water 1115 hrs 1.5 metres. Within the open match results there was the WSAA club results. Many thanks to Dave (treasurer) for compiling the prize table. Many thanks to James and Colin for raffle ticket sales. Many thanks to Bernard for running the raffle. Match 15 of 50 wednesday 16th November 2011. High water 1906 hrs 5.0 metres. Wednesday nights 3 hr match started right on high water, 5.0 metres, with a gentle south easterly swell and no wind. Local cliff and Sandsend beach marks, sadly no piers, being the choice venues. Dave Perrett was man of the match with a mixed bag, but heaviest bag of the season so far, of codling, pouting, billet and rocklings, 10 fish for 14 lb 15 oz. There were whitings and flatties and the best cod of 5 lb 02 oz was caught by Mick Beedle. It was also Doubles knockout 1st round. The match between M Garbutt & J Gilpin V P Kilpatrick & P Horbury will be fished next wednesday. 14th C Stainthorpe with 1 fish for 8/16oz. Match 16 of 50 Sunday 20th November 2011. Slack tide, low water 1715 hrs, 2.1 metres, with high water 2320 hrs 4.8 metres. For this time of year, once again, conditions are not what is expected. Flat calm sea, gentle south westerly breeze increasing and moving to south south westerly with a distinct chill in the air. Where are the northerly gales, tempestuous seas to bring the fish close in to shore to feed? Anglers fishing a slack flooding tide had to travel far to deep water cliff marks. 12 anglers at the scales for 24 fish for 24 lb 04 oz. 12th D Perrett with 1 fish for 7/16oz. Match 17 of 50 Wednesday 23rd November 2011. Low water 2023 hrs 1.5 metres, tides will be turning around after this week with the bigger tides at night. Wednesday nights 3 hrs match started 1 1/4 hrs before low water, 1.4 metres. With a blustery south westerly wind, flat calm sea and crystal clear water. Finding a fish or two tonight would be a real bonus and 8 anglers did just that. Twelve fish weighed in for 20 lb 05 oz. P Short man of the match with 1 codling for 4 lb 07 oz. 8th A Cass with 1 fish for 8/16oz. Match 18 of 50 Sunday 27th November 2011. Low water 2333 hrs 0.9 metres. In the doubles knockouts J Gilpin & M Garbutt, with a combined weight of 3 lb 02 oz, were knocked out by P Kilpatrick & P Horbury, with a combined weight of 12 lb 05 oz. The semi finals of which will be fished on 7th December. WSAA Club-men are reminded the next round of the singles knockouts is next wednesday 30th November. 16th R Allison with 1 fish for 4/16oz. Match 19 of 50 Wednesday 30th November 2011. High water 1925 hrs 5.3 metres. Wednesday nights 3 hr match started a ½ hr before a high water of 5.3 metres, flat calm and a howling south south westerly wind. The majority of the conditions throughout November have been southerly winds and flat calm conditions with anglers struggling to find fish. Last night was no exception with anglers travelling to Redcar looking for Whiting and to Bempton after a codling or lesser spotted dog fish. Despite the conditions there was a good turn out of anglers, with only four failing to weigh in. Ben Laws was man of the match with 11 Whiting for 8 lb 10 oz. Eleven anglers weighed in 31 fish for 27 lb 05 oz. So this concludes Novembers fishing and in comparison with 2010 where 640 lbs of fish were 'weighed in', only 314 lbs 08 oz have been 'weighed in', in 2011. In the singles knockout M Lamb beat W Atkinson, N Inglis beat M Garbutt. The matches between M Beedle and P Kilpatrick, C Stainthorpe and A Cass will be fished on Sunday. Match 20 of 50 Sunday 4th December 2011. Slack tide, low water 1720 hrs, high water 2322 hrs 4.4 metres. Winter is here, at last. Sunday nights 4 hr match started 40 mins after low water on a very slack tide of 2.5 metres low water and 4.4 metres high water. A strong and strengthening chilly westerly wind and growing north westerly swell, conditions were ideal. However many spots did not fish as expected probably due to the fact that there is plenty of feed 3 mile off. With local skippers reporting mackerel still being caught and herring in crab pots. Both Neil Inglis and Denis Thompson, joint 1st with 7 lb 04 oz. Bernard Vasey returned with a codling of 6 lb 11 oz. Ten anglers were at the scales with 22 fish for 37 lb. In the singles knockouts C Stainthorpe beat A Cass. The match between P Kilpatrick and M Beedle will be fished again as neither weighed in. Doubles semi finals on wednesday 7th December 2011. Cloughton Open on sunday 11th December 2011. Match 21 of 50 Wednesday 7th December 2011. Low water 2005 hrs 1.9 metres. Doubles semi finals AC & PG v BL & MB, PK & PH v DH & NI. Wednesday nights 3 hr match started an hour before low water on a very slack tide. With ideal sea conditions, north westerly swell but a strong west north west wind. Tonight's results and weigh in were the best so far this season with 15 anglers at the scale with 34 fish for 92 lb 10 oz. Only 5 anglers failed to weigh in. 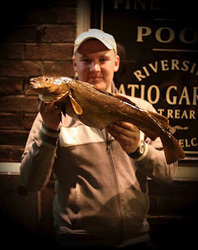 Ben Laws had 2 fish for 15 lb 01 oz with the heaviest fish of the season so far, a cod of 10 lb 03½ oz, photos attached. M Garbutt had the heaviest bag of fish so far this season with 16 lb 11 oz. Ben Laws, WSAA, Wednesday 7th December 2011, 10 lb 03½ oz. Photograph by Peter Horbury. The singles knockout match between P Kilpatrick and M Beedle will have to be fish again a both failed to weigh in. In the doubles knockouts P Horbury & P Kilpatrick were beaten by D Hambley & N Inglis. A Cass & P Garbutt were beaten by B Laws & M Beedle. T he final between these two winners will be fish on 4th January 2012. Match 22 of 50 Sunday 11th December 2011. Low water 2241 hrs 1.1 metres, also Cloughton Open. Sunday nights 4 hr match looked promising with long distant north westerly swells and a gentle westerly wind. Low water was at 2241 hrs on a 1.1 metres, so for the entire match, the tide was ebbing. 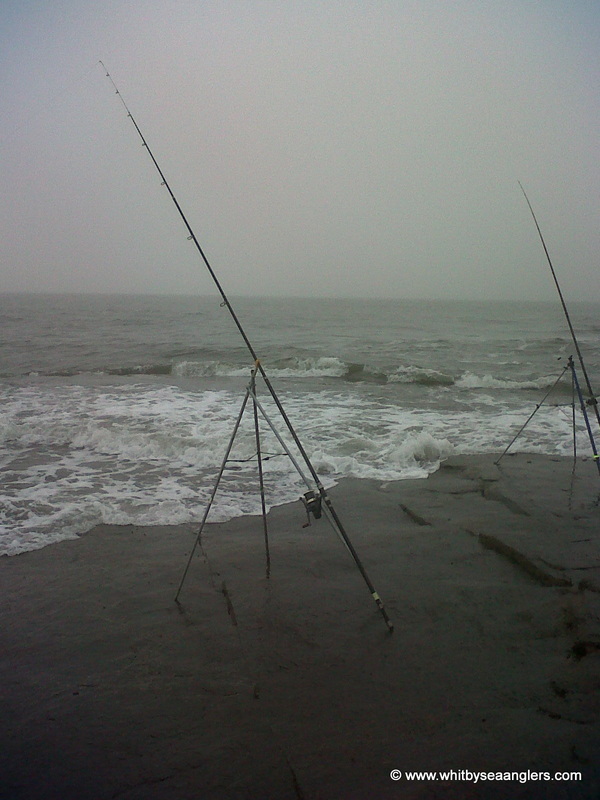 However many anglers were reporting a surging tide which spoilt many locations. But Matthew Garbutt not only found the heaviest fish, 7 lb 04 oz, of the night but an impressive bag of fish for 13 lb 14 oz. Nine anglers were at the scales with 22 fish for 28 lb 08 oz. In the singles P Kilpatrick beat M Beedle and the quarter finals are on wednesday 21st December 2011. Match 23 of 50 Wednesday 14th December 2011. High water 1810 hrs 5.4 metres. Wednesday nights 3 hr match started an hour after high water. With strong westerly winds and a flat calm sea, anglers had to take the initiative and travel further afield to be competitive. Whiting being the fish of choice, M Garbutt had 23 for 17 lb 08 oz, making that the heaviest bag of fish so for the month of December. Eleven anglers were at the scales with 105 fish weighed in for 84 lb 15 oz. Next Sunday 18th December is our Christmas match, fishing 1400 1900 hrs weigh in and food at the Fleece, Church Street. 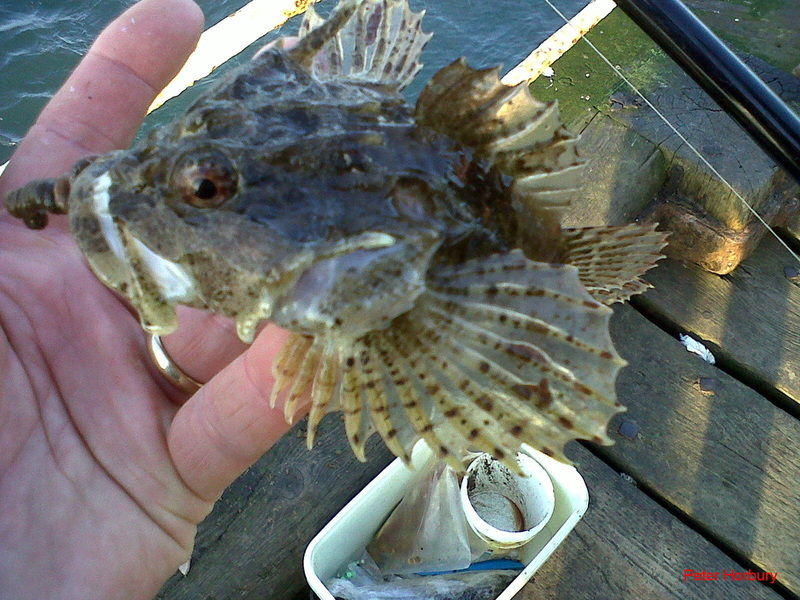 Low water 1527 hrs 2.0 metres - fishing 1400 - 1900 hrs. Sundays match was our Christmas match where every club member receives a prize whether they caught a fish or not. Fishing times were 1400 - 1900 hrs, with the 'weigh-in' from 1900 - 2000 hrs, at the Fleece Church Street, hot food provided. The 5 hrs match started 1½ hrs before low water 2.0 m, on a slack tide. Twenty three members were fishing in what can only be described as arduous conditions. 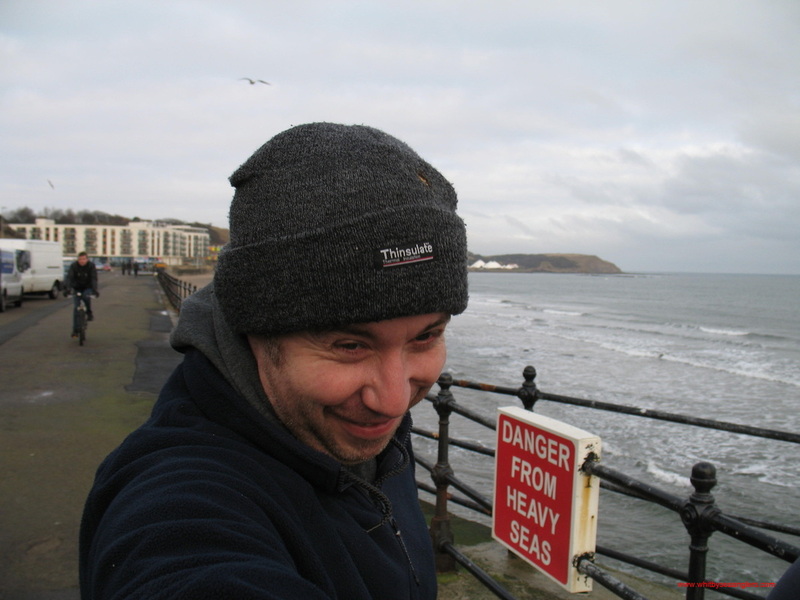 With a strong and very chilly north westerly wind and a roaring north westerly swell. As soon as the sun dropped over the horizon temperatures dropped below freezing with anglers reporting frozen sand. Thirteen anglers were at the scales to weigh in 30 fish for 78 lb 06 oz. M Garbutt, once again, lead the way with a bag of 4 fish for 14 lb 08 oz. M Lamb caught the heaviest fish of 6 lb 04 oz. 13th P Horbury with 1 fish for 4/16oz. 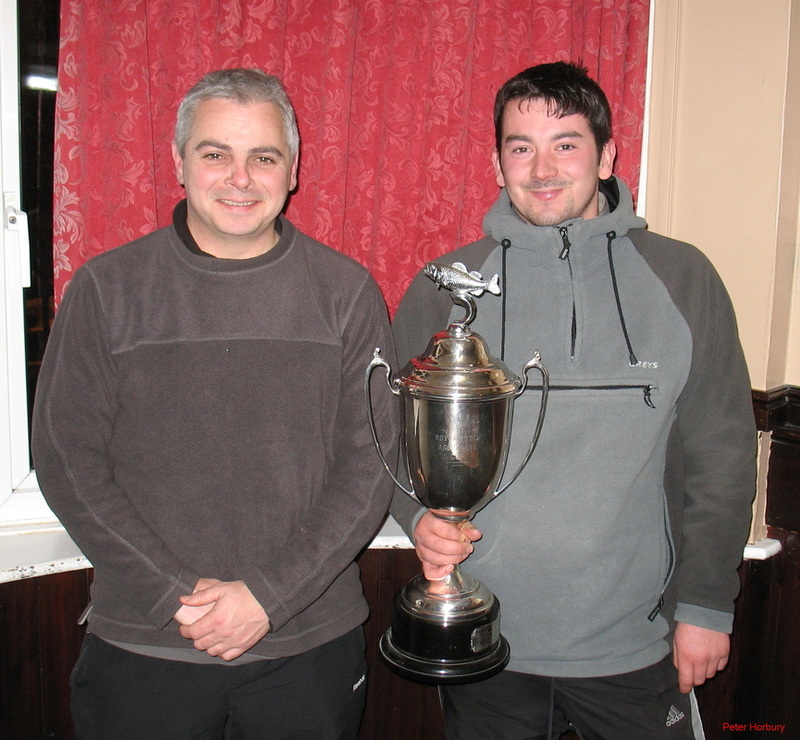 M Lamb ( heaviest fish 6 lb 04 oz ) and M Garbutt, overall winner of 2011 Christmas Match with 4 fish for 14 lb 08 oz. Match 25 of 50 Wednesday 21st December 2011. Singles knockouts and the ½ way point of the season. Well, here we are 25 of 50 matches and in the past 4 matches (inc last night) M Garbutt has weighed in 62 lb 07 oz. With a gentle to moderate south westerly breeze and a little long distant swell, anglers knew it was to be a hard match on the shortest day. The 3 hr match started right on low water, 1.7 metres on a slack tide. M Garbutt was man of the match, showed the others how to do it and had the heaviest bag of 19 fish for 14 lb 08 oz. So at the half way point - 890 fish have been weighed in for 1,159 lb 03 oz. Neil Inglis beat C Stainthorpe. The singles final will be held on wednesday 14th January 2012, between M Lamb and N Inglis. The Doubles Knockout final will be on the 1st match of the New year wednesday 4th January 2012. B Laws and M Beedle fish against D Hambley and N Inglis. Match 26 of 50 Wednesday 4th January 2012. Low water 1827 hrs 2.4 metres. Wednesday nights 3 hr match started a ½ hrs after low water, 2.4 metres, on a slack tide. The exceptionally strong westerly wind had knocked back the north westerly swell. Many anglers were taken by surprise at how quickly the swell had been knocked back. M Garbutt had an impressive bag of whiting, while M Beedle had a single cod for 5 lb 08 oz. Eight anglers were at the scales to weigh in 35 fish for 32 lb 08 oz. In the Doubles Knockout Final, B Laws & M Beedle (5 lb 08 oz) beat D Hambley & N Inglis (3 lb 03 oz). Singles Knockout Final next wednesday 11th Jan 2012, M Lamb V N Inglis. In the leader Board, M Garbutt increases his lead to 45 lb 12 oz. Match 27 of 50 Sunday 8th January 2012. Low water 2146 hrs 1.3 metres. Sunday nights 4 hr match was all ebb up to low water at 2146 hrs, however the height at low water was a lot less than the 1.3 metres predicted. With a good north westerly swell and a gentle, but increasing westerly wind. Conditions were ideal, with colour in the water, anglers confident of a fish or two. M Lamb was man of the match with 4 fish for 17 lb 09 oz, with 2 fish over 6 lb. He now has the heaviest bag of fish for January and the for the season so far, beating M Garbutt by an ounce. He also has the heaviest fish of the month 6 lb 04½ oz. Nine anglers were at the scales with 22 fish for 51 lb 13 oz. 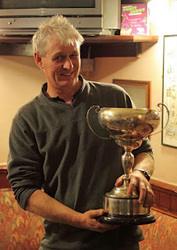 Next Wednesday 11th Jan 2012 is the Singles Knockout Final, between M Lamb and N Inglis. Match 28 of 50 Wednesday 11th January 2012. High water 1717 hrs 5.7 metres. Wednesday nights 3 hr match started 2 hrs after high water, 5.7 metres, with little localised swell and a strengthening south westerly wind. Anglers had to travel in order to be competitive and the singles final was being fished between M Lamb and N Inglis. Ten anglers weighed in with 114 fish for a total of 94 lb 08 oz, the largest weigh in this season. Nine of those anglers were all at the same fishing mark so the competitive instinct between anglers was exciting. A Cass was man of the match with a bag of 17 whiting for 13 lb 07 oz. M Beedle caught the only codling of 4 lb 11 oz. In the singles knockout final N Inglis (12 lb 15 oz) beat M Lamb (7 lb 15 oz). Match 29 of 50 Sunday 15th January 2012. High water 2010 hrs 5.3 metres. What a difference 24 hrs can make! Friday and saturday saw perfect swell and many anglers from far and wide, made the most of it. With a double figure cod being caught by a previous WSAA member B Harland on saturday night, 11 lb 10 oz. Reports of other double figure fish coming from the west pier. But sadly reports of near fighting on the end of the west pier as one angler with more than one rod decided the end of the pier was his and his alone. And what of sunday, club night, flat calm sea conditions, a slight south easterly breeze and temperatures near zero? Club members were back to 'scratching' for a few whiting. High water 5.3 metres was at 2010 hrs. M Garbutt was man of the match with 17 whiting for 13 lb 06 oz with D Hambley catching the only codling. Ninety fish were weighed in for 70 lb 05 oz. D Hambley caught the only codling. In the leader board after 29 of 50 matches M Garbutt extends his lead to 60 lb 04 oz over N Inglis with P Garbutt only 1 lb behind him. Match 30 of 50 Wednesday 18th January 2012. Low water, very slack tide, 1726 hrs 2.0 metres. Match 30 of 50, 3/5ths of the season completed and last night was the worst weigh in, beating the previous low by 5 lb 01 oz. Flat calm sea, south westerly breeze, slack tide and crystal clear water. Many anglers opting to travel in the hope of picking up a whiting or two and quite literally that is what happened. Even the whiting are proving harder to find. Eight anglers were at the scales to weigh in 14 fish for 10 lb 01 oz. The previous low weigh-in was on the 1st match of the season was 12 fish for 15 lb 02 oz. The forecast for the weekend is good from an anglers point of view with north westerlies due. 31 of 50 Sunday 22nd January 2012. Low water 2143 hrs 1.0 metre. Sunday nights 4 hour match finished just after low water 2143 hrs, on what was supposed to be at a height of 1.0 metre. However the tide ebbed away fast, as the strong westerly wind pushed it back further than expected. Many anglers reporting marks emptying out and new features were visible. With a regular north westerly swell, anglers were keen to be out and made off to their favourite marks. P Horbury was man of the match with 2 codling for 7 lb 09 oz. J Gilpin caught the heaviest fish of 6 lb 14½ oz, which now takes the leader board for the heaviest fish caught in a match for the month of January. Nine anglers were at the scales with 10 fish for 37 lb 01 oz. 9th M Bowman with 1 fish for 4/16oz. Match 32 of 50 Wednesday 25th January 2012. High water 1719 hrs 5.7 metres or if you prefer low water 2343 hrs 0.8 metres. Wednesday nights 3 hr match started 1 hr 40 mins after high water, 5.7 metres, on one of the biggest tides for January. With a strong south westerly wind and a flat calm sea (how many times this season have we heard this), anglers had to travel in order to find a few whiting. M Lamb was man of the match with 14 whiting for 11 lb. Nine anglers were at the scales with 56 fish for 45 lb. 9th A Cass with 1 fish for 7/16oz. Match 33 of 50 Sunday 29th January 2012. High water 1942 hrs 5.0 metres. Heaviest Fish J Gilpin 6 lb 14½ oz (22nd Jan). That concludes the fishing for the month of January, 364 lb 06 oz was weighed in. 8th A Cass with 1 fish for 6/16oz. Match 34 of 50 Wednesday 1st February 2012. Low water 1609 hrs 2.4 metres or high water 2222 hrs 4.2 metres, slack tide. Easterly seas, never a good sign, it may stir up the feeding grounds but never seems to produce many fish. With a flooding, slack tide, east south east winds, wednesday nights 3 hr match finished shortly before high water 4.2 metres. Fourteen anglers fished, and only 4 managed to weigh in, 4 fish for 4 lb 08 oz. 18th January was the last poor weigh in (10 lb 01 oz, 14 fish) and hopefully things will improve with this cold spell. 4th W Atkinson with 1 whiting for 12/16oz. Match 35 of 50 Sunday 5th February 2012. Slack tide, low water 2043 hrs 1.6m. Sunday nights 4 hr match had its own draw backs weather wise. The forecasted heavy snow fall just did not materialise. The snow was melting as fast as it had fallen and the warm breeze during the afternoon was stopped as soon as night fell and so did the temperature. On a clear cloudless night, a bright full moon, crystal clear water, very little easterly swell and a gentle south westerly breeze, prospects of a bag of fish were very optimistic. To the north one could see the flickering red dome of light from Tees Sides industries and out at sea to the east, there was a storm brewing with a fine display of lightening. Low water was at 2043 hrs, 1.6 metres. Some anglers elected to stay at home but its the die hards who stick at it and pick up an odd fish or two, nibbling away at the weights of those in front. In the leader board, D Perrett and A Cass are now separated by only 8 ounce for 6th place with only 15 matches left. Only 3 anglers were at the scales with 6 fish for 5 lb 05 oz. 3rd P Horbury with 2 dabs for 1 lb 8/16oz. Match 36 of 50 Wednesday 8th February 2012. Low water 2246 hrs 0.6 metres. Last night was very trying, one due to the cold weather, -2 deg C (trying to keep bait from refreezing), and two, due to the scarcity of the fish. An ebbing tide, with low water at 2246 hrs, 0.6 metres, a little easterly swell meant crystal clear water and a with chilly southerly breeze. Anglers had to travel in order to be competitive with local venues just not producing any fish. Out of 12 anglers who fished only 4 were at the scales with 18 whiting for 13 lb 05 oz. 4th P Horbury with 4 fish for 2 lb 10/16oz. Low water 1259 hrs 1.0 metres. Match 38 of 50 Wednesday 15th February 2012. High water 2159 hrs 4.6 metres. Wednesday nights 3 hr match finished right on high water, 2200 hrs, 4.6 metres, with a strong north north westerly sea running. Wind was a strong north westerly on a very mild evening. I have never seen so many lights down Runswick Bay, 20+, as Redcar, Navy and Gentleman's Club was also fishing. Many disappeared as quickly as they arrived, as conditions were against them. Weed was a big problem and so was the drag, as the beach filled up with large swells and then retreated. However the West Pier was the place to be as Matthew Garbutt caught the heaviest fish, and heaviest bag of the month so far 1 codling for 6 lb 06½ oz. This landing was not without some luck or destiny, as it appears to be Matthew's year. Another angler was snagged up with his line around Matthew's as he was reeling the fish in. The other angler snapped his line and Matthew's, with the fish falling down the side of the pier. Fellow WSAA member Neil Inglis told Matthew the bad news but when Neil lifted his drop net, Matthew's fish was suspended from under the drop net. The rotten bottom clip on his trace had caught in the mess of the drop net and the fish was landed. Destiny or what?? 3 anglers weighed in 3 fish for 13 lb 10 oz. 3rd J Gilpin with 1 fish for 2 lb 2/16oz. Match 39 of 50 Sunday 19th February 2012. Low water 2044 hrs 1.4 metres. Sunday nights 4 hr match was fished over low water, 2044 hrs with a predicted ebb of 1.4 metres. With a northerly sea running and a north westerly breeze, expectations were high. All anglers reported the predicted ebb of 1.4 metres was more like a 0.9 metre or lower and many venues had already emptied before the match started. Heavy surging did not help but that did not stop M Garbutt from his 4th win in a row with the heaviest bag for the month. M Beedle found the heaviest fish of the night, 6 lb 04 1/2 oz. 9 anglers were at the scales to weigh 9 fish for 27 lb 04 oz. 7th C Stainthorpe with 1 fish for 7/16oz. Match 40 of 50 Wednesday 22nd February 2012. Low water 2244 hrs 0.8 metres. 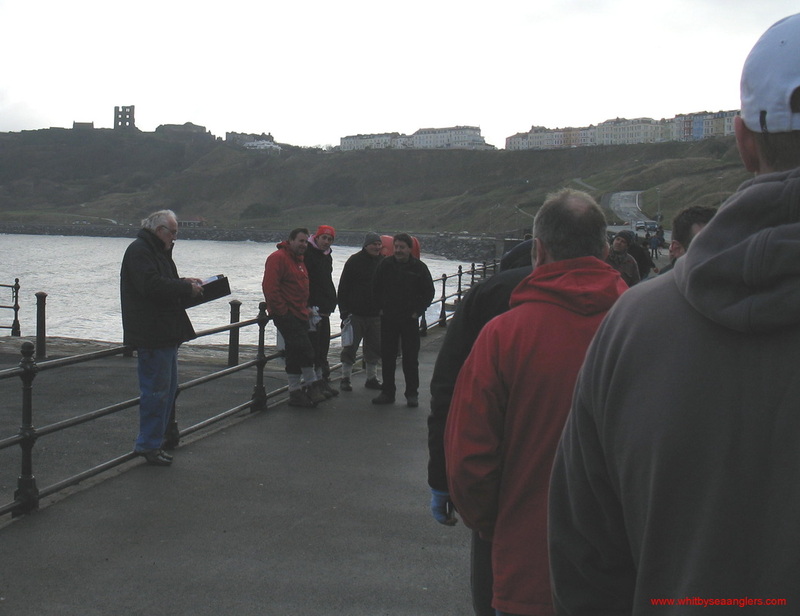 Once again the weather was against the anglers, with a flat calm sea and strong south westerly winds. Low water was at 2244 hrs with an ebb of 0.8 metres, the second largest tide of the month. Once again anglers had to travel in order to be competitive and if you study the leader board, where 10 lb of whiting can make a big difference to an anglers standing, especially as there are only 10 matches left of the season. Eight anglers weighed in 85 fish for 68 lb 05 oz, with 7 of them fishing the same location. A Cass was man of the match with 18 whiting for 14 lb 06 oz. 8th R Allison with 2 fish for 10/16oz. Match 41 of 50 Sunday 26th February 2012. High water 1832 hrs - 5.3 metres. Sunday nights 4 hr match started a ½ hr before high water 5.3 metres, with little swell and a stiff south westerly breeze. Once again anglers had to travel, some north, for whiting and some south for the chance of a codling or two. Ben Laws was man of the match with 12 whiting for 11 lb 05 oz and Martin Lamb caught the heaviest fish, a codling for 4 lb 12 oz. Twelve anglers were at the scales to weigh in 48 fish for 50 lb 10 oz. In the leader board both B Laws and M lamb have passed P Garbutt, who was 3rd. Match 42 of 50 Wednesday 29th February 2012. High water 2030 hrs 4.4 metres. Wednesday nights 3 hr match was over high water, 2030 hrs, 4.4 metres, on a very slack tide with little tidal rip. Flat calm sea conditions, crystal clear water and a sight south westerly breeze. Once again anglers were down to 'scratching' for what ever was available. Some travelling north to Redcar and others south to Bempton, like last Sunday's match. The weigh in consisted of dog fish and whiting. 9 anglers were at the scales to weigh in 28 fish for 26 lb 03 oz. M Beedle was man of the match with 3 lesser spotted dog fish for 5 lb 02 oz. P Garbutt was back pushing his way to the front, to regain one of two places he lost last week. 9th J Allison (Jnr) with 1 fish for 7/16oz. Heaviest Fish was won by Matthew Garbutt with 6 lb 06½ oz (19th Feb). Match 43 of 50 Sunday 4th March 2012. Low water 1918 hrs 1.9 metres. Sunday nights 4 hr match started an hour before low water on a slack tide, 4.4 metres high and 1.9 metres low. On sunday morning the sea was flat calm but with a north westerly force 6-8 forecast, all calm and tranquility would change and change it did. Snow, sleet, and a bitter wind did not stop 14 anglers from trying to find a fish or two. Only two anglers were at the scales to weigh in 3 fish for 3 lb 04 oz. Dave Hambley man of the match with one codling for 1 lb 14 oz. There are 7 matches left before the season finishes on wednesday 28th March. 2nd P Horbury with 2 flounders for 1 lb 6/16oz. WSAA Presentation night is on Friday 6th April at 'The Stables'. Match 44 of 50 Wednesday 7th March 2012. Low water 2141 hrs 0.7 metres. Scratching, again, members will be glad when this season finishes. Strong westerly winds, no swell, full moon, big tide and crystal clear water. Wednesday nights 3 hr match finished just after low water, 2141 hrs 0.7 metres. Six anglers were at the scales with 21 fish, mainly whiting for 15 lb 04 oz. A Cass was man of the match with 7 whiting for 5 lb 08 oz. 6th W Atkinson with 1 fish for 8/16oz. Match 45 of 50 Sunday 11th Match 2012. High water 1803 hrs 5.9 metres. 5 matches left and once again members were down to 'scratching'. Flat calm sea, crystal clear water and the biggest ebb tide of the month. The 4 hr match started right on high, 1803 hrs, 5.9 metres. The weigh in reflected that anglers had travelled to the boundary lines. Whiting from Redcar and lesser spotted dog fish from Bempton. 13 anglers were at the scales with 32 fish for 40 lb 11 oz. W Atkinson was man of the match with 8 whiting for 7 lb 10 oz, which is also the heaviest bag for March. B Laws caught the heaviest fish, a codling for 4 lb 01½ oz, which is also the heaviest fish for March. 13th P Horbury with 1 fish for 13/16oz. Match 46 of 50 Wednesday 14th march 2012. High water 2035 hrs 4.8 metres. Wednesday nights 3 hr match was fished over high water, 2035 hrs 4.8 metres. There was some long distance northerly swell and a gentle chilling breeze. The weigh in was a mix of whiting, dabs, flounders, lesser spotted dog fish and some white cod. 13 anglers were at the scales with 29 fish for 41 lb 15 oz. Rob Allison was man of the match with the heaviest bag of the month 9 lb 04 oz. Ben Laws caught the heaviest fish of the evening, a cod for 4 lb 00 oz, 2 oz short of beating his best on sunday. 13th D Perrett with 1 fish for 14/16oz. Match 47 of 50 Sunday 18th March 2012. Low water 1934 hrs 1.7 metres. 40 lb 12 oz. Bempton proved too much for N Inglis who hooked a fish he was unable to lift up the 400 ft cliff face and snapped his line. Colin Stainthorpe - 12 lb 11 oz Cod. Colin Stainthorpe - 12 lb 11 oz - Photograph by Peter Horbury. 9th P Horbury with 2 fish for 11/16oz. Match 48 of 50 Wednesday 21st March 2012. Low water 2144 hrs 1.0 metres. 6 lb 08 oz. This has nudged him to 2nd place in the leader board by 12 ounces in front of N Inglis, with two matches left. The last two places are all to fish for with D Hambley 2 lb behind W Atkinson in 10th. W Atkinson is 2 lb 08 oz behind P Horbury in 9th. Clocks go forward this weekend so the last 2 matches will be fished mainly in daylight which is not promising. 9th M Lamb with 2 whiting for 1 lb 8/16oz. Match 49 of 50 Sunday 25th March 2012. High water 1832 hrs 5.4 metre. Unfortunately the good weather and BST was not good for fishing the penultimate match of the season. The 4 hrs match started ½ hr before high water, 1832 hrs 5.4 metres. A calm sea, cloudless sky, with crystal clear water, bright sunshine, made only for a photogenic sunset over Sandsend. A gentle southerly wind and virtually no chance of catching a fish until it got dark. Anglers were back to scratching for ever was available. Seven anglers were at the scales with a mix of fish, rocklings, coal fish (billets), codling, 12 fish weighed in for 18 lb 13 oz. The heaviest fish, a codling, 4 lb 04 oz, was caught by Mick Beedle. Joint first for heaviest bag of fish was M Beedle and N Inglis 4 lb 04 oz. 7th J Verrill with 1 rockling for 6/16oz. In the leader board N Inglis takes back 2nd place from B Laws, which he lost last wednesday. D Hambley has passed W Atkinson for 10th place and is now 1 lb 06 oz behind P Horbury in 9th. Match 50 of 50 Final match of the 2011 - 2012 season Wednesday 28th March 2012. High water 2016 hrs 4.7 metres. The final match of the 2011-2012 season was fished on wednesday 28th March 2012. The 3 hr match started 76 minutes before high water, 2016 hrs, 4.7 metres. Sixteen anglers were fishing to maintain their places or to clinch a final place in the top ten. BST meant it did not get dark until 2000 hrs and with a flat calm sea, crystal clear water, once again, anglers were down to scratching for whatever was available. 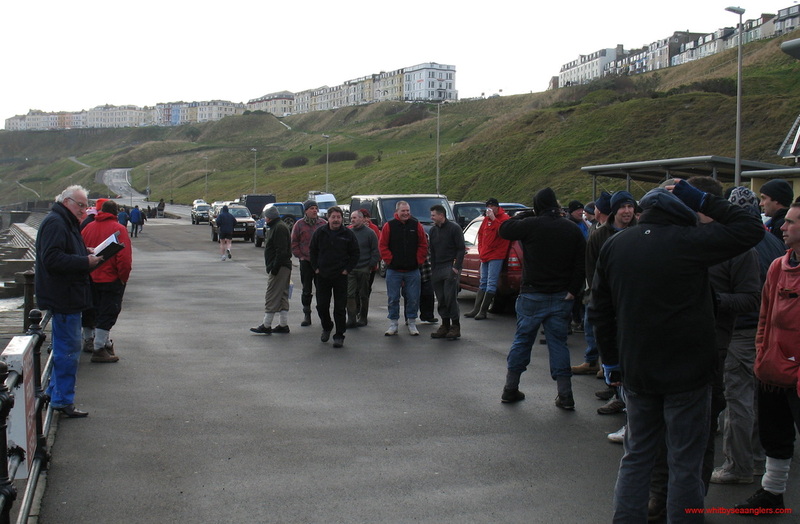 Marine Drive in Scarborough produced a few billets and a codling. Enough for D Hambley to clinch 9th place from P Horbury, who finished the season in 10th. Only 7 anglers were at the scales with 12 fish, billets, codlings and rocklings for a weight of 14 lb 02 oz. 7th B Laws with 1 fish for 5/16oz.